It is hard to imagine that being at a ski area in Colorado on a weekday in February could be anything other than an outrageously fun experience, but I’m going to persuade you otherwise. After spending three great days on the slopes of Beaver Creek the previous week, I was excited to get back to the mountains to hopefully repeat the experience. My friend, John Broadbent, called to let me know he was in Denver the week of February 17, so we made plans to ski on Thursday February 20. Jane had tennis on Tuesday and Wednesday night, so Thursday was the only day when she could be included for a day of skiing. Once we settled on Thursday as our day, I contacted Fred Young and David Gaige to see if they wished to join us. Fred replied almost immediately that he and his wife Douggie were in, and David Gaige replied a bit later that he and wife Karen would like to join as well. The plan was set. Jane and I would pick up John at his downtown condo and then drive to the Woolly Mammoth parking lot to meet Dave and Karen. We would car pool from there to Breckenridge and meet the Youngs at the Peak 8 base lodge at 9AM. Unfortunately at the last minute an important project came up at work for Jane, so she was forced to withdraw from the weekday ski adventure, and she was rather upset about the sacrifice. Everything else, however, played out pretty much according to plan; and John, Dave, Karen and I arrived at the Peak 8 base by 9AM. Fred and Douggie called to say they were running late so we changed the meeting time to 9:30 and decided to take one warm up run from the Colorado chair. 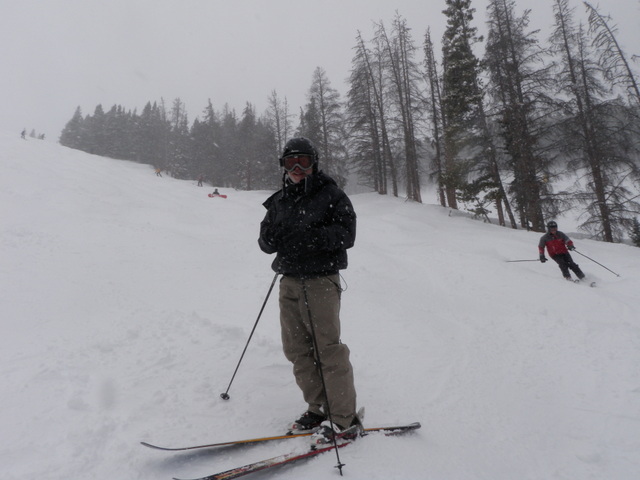 The roundtrip of riding up the Colorado chair and then skiing down Springmeier proved to be one of the most challenging ski runs of my life. 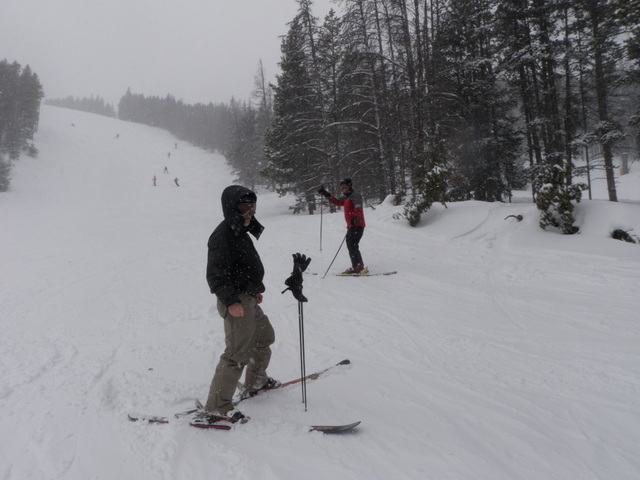 The air temperature was just above 0 and it was snowing lightly with 20 MPH winds whipping across the mountain. I had on my toe warmers and pulled my hood up over my helmet and turned my face away from the wind, but the small amount of exposed flesh on my face felt like it was being stabbed with a thousand pins. Meanwhile my hands were already aching and beginning to turn numb despite having liner gloves nested inside my mittens. As I skied downward I could feel cold air blowing through my coat, and it is rare that my core is cold. Fortunately we arranged to meet the Youngs inside the lodge, and that gave me an excuse to use the bathroom and warm my hands under the hand dryer, and once I met up with the group again I borrowed some handwarmers from Dave Gaige. Meanwhile there was a huge line extending from the coffee bar and an equally long queue approaching the small ski shop in the corner of the lodge. I suspect Breckenridge did a brisk business in hand warmers, toe warmers, balaclavas, mittens and hats on the day. I’d like to report that the conditions improved, but that was not the case. The wind and snow and cold continued unabated until around 2:30 in the afternoon. I somehow managed to make five or six runs before lunch, but as I strode into Vista Haus my feet felt like stumps despite the advantage of toe warmers inside my boots. After lunch we remained on Peak 8 and did another three or four runs before John and I agreed to head back into the lodge and warm up. We found a spot at one of the tables and warmed our bodies while waiting for the Gaiges and Youngs to get their fill of skiing in Arctic conditions. The highlight of the entire day was stopping at The Lost Cajun in Frisco for an apres ski snack. One of our servers draped a necklace of beads around our necks to celebrate Mardi Gras, and then we enjoyed Louisiana beers, seafood gumbo, and tasty beignets for dessert. I could have spent my entire day in the restaurant and skipped the skiing. Every time I type the word comparadun, my spell checker goes crazy. What in the world is a comparadun? When I began fly fishing in the 1980’s in Pennsylvania all the classic dry flies were created in the Catskill tying style. Nearly all mayflies were imitated with a fly consisting of a dry fly hook (Mustad 94840), fibers from a rooster neck hackle for a tail, a dubbed body, a wing made from wood duck flank feathers, and a hackle from a rooster neck wound around the hook shank behind and in front of the wings. The size of the fly and color of the dubbing and hackle were varied to match all the various mayflies that served as significant food to the trout. Sometime during this learning time period I purchased the book Hatches and read about the many types of mayflies and their unique characteristics and how to imitate them. The authors introduced a system of flies that they claimed could match most mayfly hatch matching situations, and they placed the prefix “compara” in front of their flies. For adult mayflies they offered a chart that consisted of four to six color combinations that could match a large percentage of the mayflies one might encounter. They also designed a style of fly that rode low in the surface film, and they claimed that this style presented a more precise silhouette of a mayfly dun particularly in smooth water. These flies were named comparaduns. 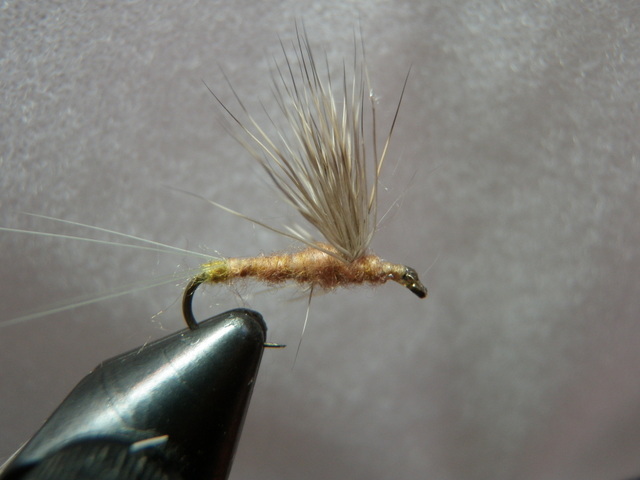 I quickly read all the chapters on the various mayflies that frequented the Northeast, but I continued to tie the Catskill style flies that required the purchase of expensive rooster necks with quality hackle feathers. I recall experimenting with a few comparaduns, but I didn’t like the appearance of my efforts using fairly undeveloped tying skills. When I moved to Colorado I continued tying Catskill style dry flies; however, the variety of mayflies was much narrower in scope, so I didn’t need to tie nearly as many mayfly imitations as I did in Pennsylvania. In fact after hiring several guides I was introduced to nymphing with a strike indicator and began to experience a significant amount of success with this method. This also pushed me away from tying mayflies and fishing the surface. Fairly soon after our move to Colorado I began attending the outdoor exposition that is held in Denver every winter, and on one of these visits I watched Marty Bartholomew demonstrate how to tie a comparadun. 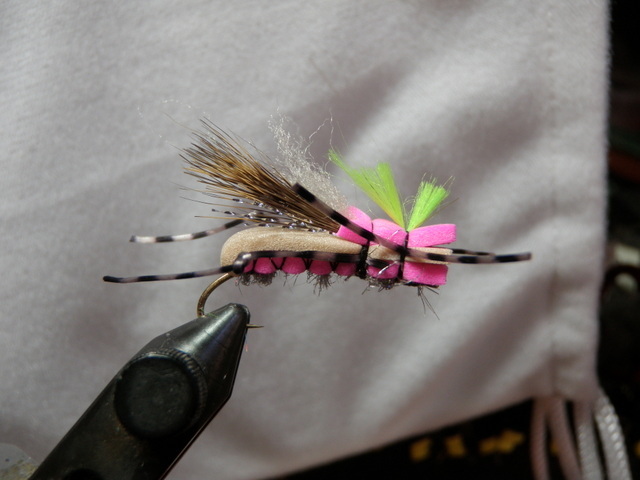 This lesson motivated me to tie a few so I could reinforce the tips and lessons learned. The two keys to making a good looking comparadun are splitting the tail fibers so that they serve as outriggers to support the hackle-less fly, and being able to splay the deer hair so that it forms a semi-circle around the hook shank. 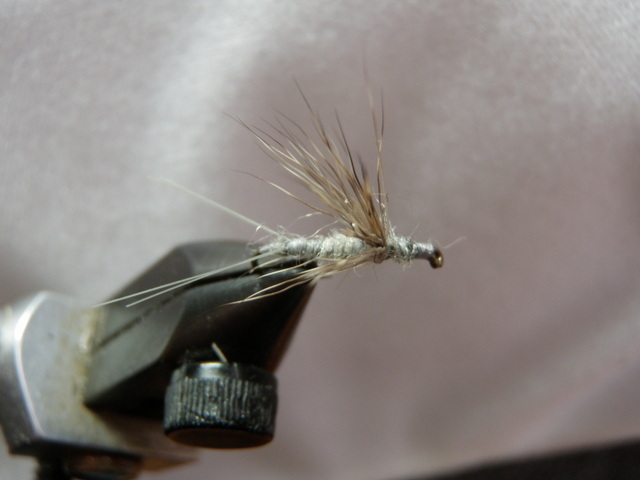 The bottom fibers of the deer hair also help to support the fly. My early efforts ignored these two basics, and I ended up with ugly flies that would not stand up, and the wing typically leaned forward unlike natural mayfly duns. Marty showed me how to split the tails so they V’ed outward from the end of the abdomen, but his major contribution was advice on forming the wing. He suggested purchasing coastal deer hair as it is much finer and easier to work with particularly on small flies; but the significant tip was to stop the dubbing short of the wing, and this left a small gap. This allowed the wing to slant slightly backward once the tyer wrapped the dubbing tightly in front of the wing; and then after the wing was positioned, he took a wrap or two behind the wing to fill in the space beneath the wing. What a difference this made! My flies looked like real mayflies with the wing cocked slightly toward the rear, and they floated nearly as well as Catskill style flies. Best of all, I no longer needed expensive neck hackles to form a collar on my flies. I now produced a nice batch of size 16 comparaduns, but I suspect they took up space in my fly box and were not utilized for a few years, until I encountered a strong pale morning dun hatch on the Colorado River. I tried some Catskill style PMD’s to no avail and in desperation reached in my box and extracted one of the size 16 light gray comparaduns. Much to my amazement this fly began to dupe brown trout like no other dry fly I had ever used. 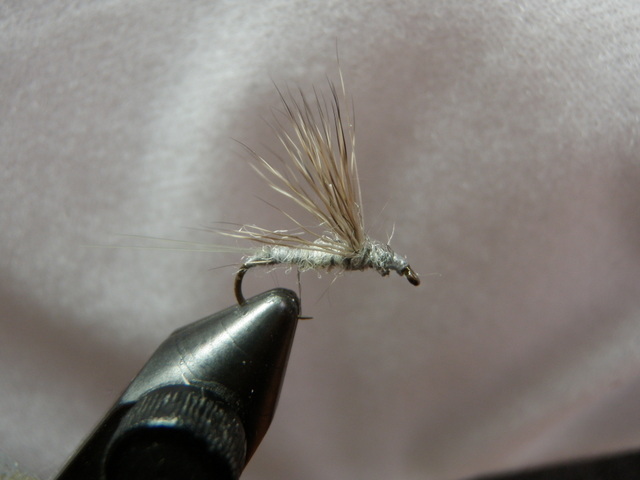 It didn’t take long before I became a disciple of the comparadun, and I began to tie them for pale morning duns, green drakes, and various eastern mayflies prior to infrequent return visits to Pennsylvania. The final step in my comparadun evolution was the discovery of microfibbets. Microfibbets are synthetic fibers that take the place of hackle fibers. One buys them as bunches and they are dyed various colors, and they look like very fine monofilament or bristles from a synthetic paint brush. Microfibbets are much stiffer than hackle fibers and make even better outrigger tails for supporting comparaduns. My supply of light gray comparaduns dwindled a bit over the last two summers, so I visited my fly tying desk and cranked out 28 new imitations over the last week or two. I tied them in sizes 14, 16 and 18 and made an equal number of light gray and cinnamon versions. During a visit to the Frying Pan River in September 2013 I discovered that the educated trout in that fabled river were selective to pale morning dun imitations with a cinnamon body, and the size of the late season PMD’s seemed to be on the small side, thus the size 18 flies. There you have it. 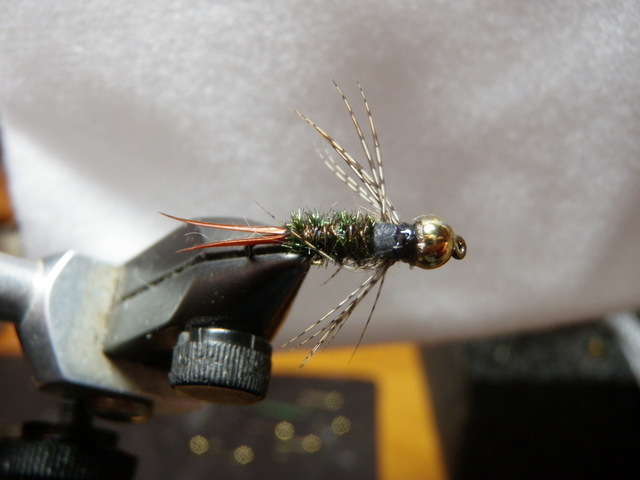 My evolution to a comparadun fan, and where I’m focusing my dry fly tying efforts in 2014. As I mentioned in my recent post on the Chernobyl Ant, I continually search for new hopper patterns that are more buoyant than a Letort hopper but also equally effective. So far I haven’t been very successful, but a guide I used in 2012 recommended a pool toy as the best hopper pattern. 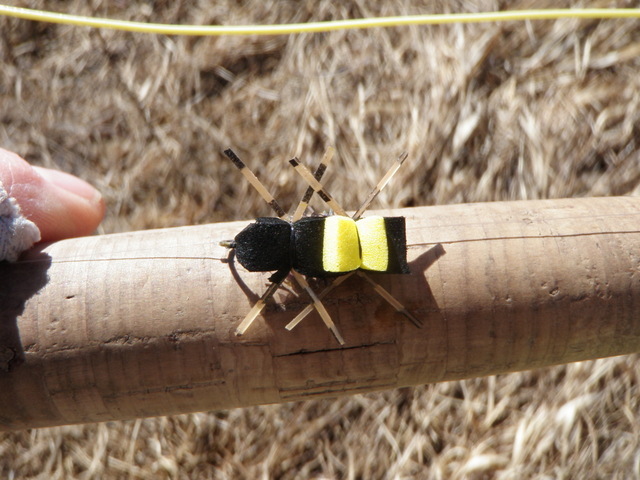 I tied some prior to the 2013 season and experimented with the resulting foam grasshoppers during the past season. Pool toys are definitely more buoyant, and I liked the ability to suspend large beadhead nymphs from these large foam creations. Pool toys are also highly visible due to the indicator and light color foam. Unfortunately I’m not yet willing to say that pool toys catch as many fish as Letort hoppers. I probably didn’t fish a pool toy as much as I should have due to a lack of confidence in a new fly, and perhaps that explains the limited success. I can remember a few occasions when the size 10 yellow pool toy produced as well as a few cutbows gulping a pink version on the White River. Because of the buoyancy and visibility, I decided to tie a few more pool toys in 2014 to add to my remaining collection from 2013. I made three tan pool toys and one pink. I’ve settled on barred sexilegs as the preferred material for appendages. I also used gray ice dub as the underbody as outlined in the material recipe from the originator, Andrew Grillos; whereas, I used a rabbit fur dubbing for the underbody on the versions I tied in 2013. I will try to recommit to pool toys as my hopper imitation of choice in 2014. I will particularly try to test them in August and September, the prime grasshopper fishing months in Colorado. What do you get when you combine a sixty degree day along the Front Range of Colorado with Sunday of Presidents’ Weekend and the South Platte River? You get a crowded stream with three or four cars in very pullout. That’s what I discovered today. Apparently a lot of fishermen had the same idea to find a cure for cabin fever. I did some minor organization to make sure I restored all my gear after jumbling it a bit for my trip to Argentina, and then I packed a lunch and took off by around 10:30AM. I arrived at the first pullout after turning right at the bottom of Nighthawk hill and geared up for my first fishing outing of 2014. It felt rather warm but a stiff breeze kicked up periodically so I pulled my fleece over my fishing shirt and then rigged my Orvis four piece four weight rod and crossed the road to the river. It was probably around sixty degrees when I began; quite nice for the middle of February. There were three or four fishermen upstream and around the first bend and several fishermen at the next pool downstream, but I found some nice space across from the parking lot. 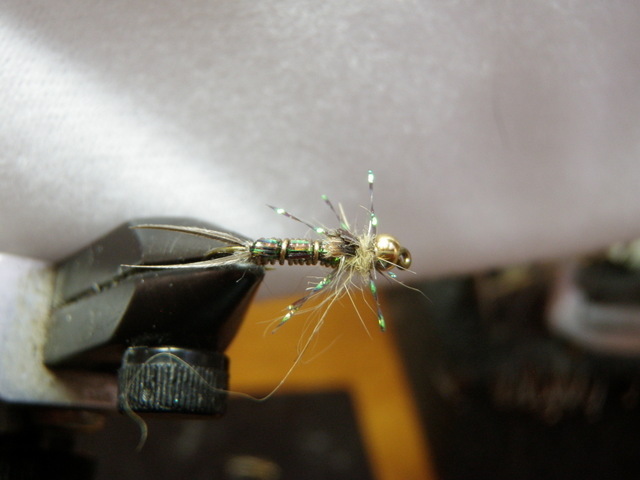 I elected to begin with one of the new fold-over Chernobyls that I tied recently and below that I added a salvation nymph. 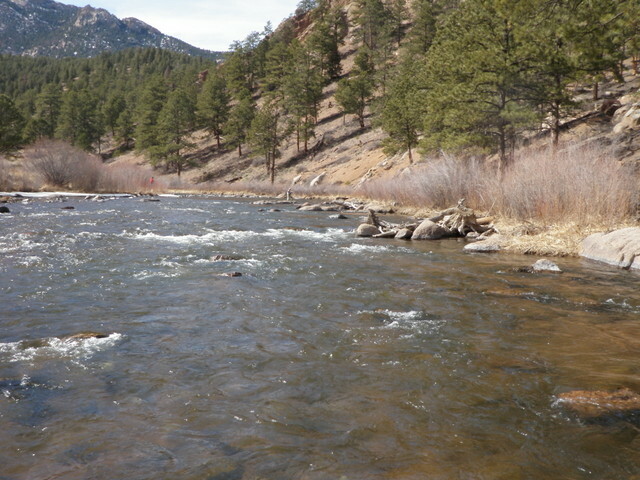 By the time I added tippet to my leader and tied on the two flies and began fishing it was around 11:30. I covered the water upstream for around forty yards, but didn’t see any fish. The next fisherman above me was blocking my path, but fortunately he grew weary of his position and exited by noon so I crossed to the north bank and began working the runs and pockets near the shore. The water was off color a tinge so I decided to insert a San Juan worm below the Chernobyl ant and then added the salvation nymph a foot or so below the worm. I was now drifting my three flies in some nice runs and pockets with a water depth of three to four feet. The stretch I was approaching is one of my favorites and generally delivers a fish or two so I increased my focus. Sure enough as the Chernobyl drifted on the outside of a nice current seam, the foam fly paused and I set the hook and saw a twelve inch brown trout as I lifted it toward the surface. Alas, this would be my only opportunity for a fish on this early season venture, but the brown somehow shook free, and I was left with a limp line. I moved upstream another 15 feet or so to an attractive area where I always spot a brown trout tight to an angled log, and sure enough I thought I spotted a fish next to the log and in front of a large submerged rock. I made four or five drifts over this spot, but on the next cast I misfired a bit too far and wrapped the nymph and worm around a willow branch. I needed to disturb the sweet run to retrieve my flies and sure enough a nice brown of 13 to 14 inches darted from the rocks as I waded through. I continued a bit but quickly bumped into another fisherman deliberately nymphing the deep ledge rock hole so I waded back toward the road and returned to the car. There were a lot of fishermen in the area so I decided to move to the catch and release area five or six miles upstream. I loaded my gear in the RAV and surveyed the river for approximately eight miles until I passed Trumbull. There were three or four cars, if not more, in every pullout so I passed them up and made a U-turn and began retracing my path back toward Nighthawk. Part way between the bridge downstream from Oxbow Ranch and Scraggy View I noticed a large pullout on the left that only had one pick up truck, so I pulled in and prepared to resume fishing. By 1:30PM the wind had become a serious issue. The water next to the parking lot was a wide shallow unattractive area with no cover for fish, so I waded upstream a bit to a place where I’d seen rising fish on previous visits, although the structure of the stream was only moderately improved. I tossed the Chernobyl plus San Juan worm plus salvation nymph for a bit but nothing was happening so I swapped the salvation nymph for a zebra midge as I noticed quite a few midges buzzing about in the air. I continued working my way upstream for another forty yards through some nice runs of moderate depth, but once again my flies were not attracting any interest. The gusting wind became unrelenting and the sun glare made it difficult to follow my fly, so at 2:30 I reeled up my flies and clipped them to the rod guide and called it a day. I was actually feeling quite chilled as I no longer wore my fleece, so this contributed to my decision to surrender on Sunday, February 16. It was fun to get on the river in February, and my fold-over Chernobyl seems to be solid, although it still hasn’t faced the cycle of catching and releasing a fish. The crowds and wind however were more than I bargained for. I made a mental note to only fish the South Platte River during weekdays in the future. 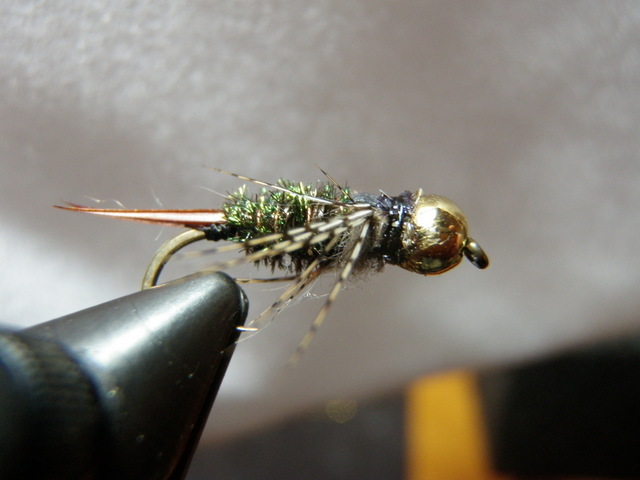 Prior to 2013 my workhorse flies and the first flies I would offer to fish as I began my day were a yellow Letort hopper trailing a beadhead hares ear nymph. These flies served me well; however, I became increasingly annoyed by the tendency of the yellow dubbed body of the Letort hopper to become saturated with water and sink. If the fish tuned into the surface fly I could tolerate frequently pressing the body against my shirt to absorb moisture and then a quick dunk in my dry shake canister. I tried making alternative hoppers such as the Charlie boy hopper and the pool toy that employed a foam body and offered more buoyancy, but these flies did not catch fish at the same rate as the yellow Letort hopper. When I realized that the foam hoppers were not as effective as my trusty Letort hopper, I began to go to a Chernobyl ant more and more as my first fly of the day, and I quickly discovered that fish love Chernobyl ants. 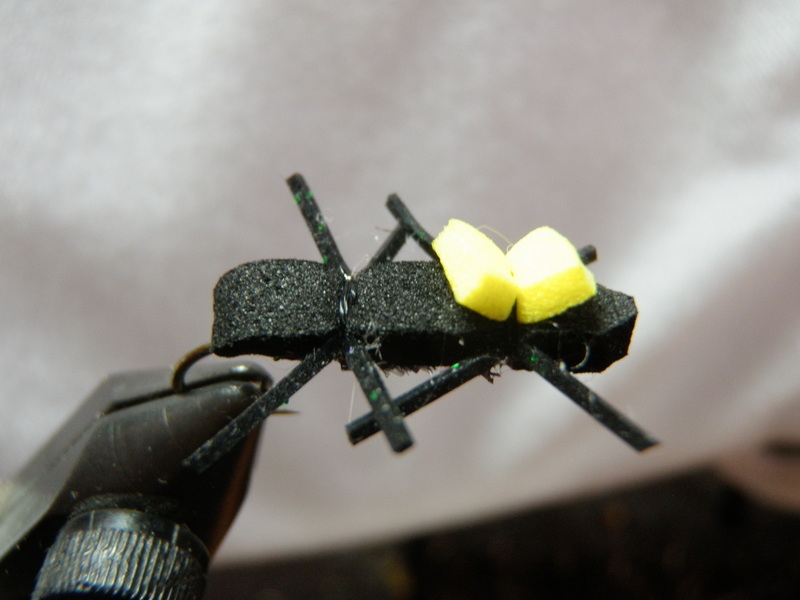 The black foam body floats much better than the Letort hopper and can easily suspend beadhead flies such as size 14 beadhead hares ear nymphs. A size 10 Chernobyl ant replaced the Letort hopper as my new number one visible attractor top fly on a dry/dropper arrangement. The beadhead hares ear remains as my number one subsurface option. 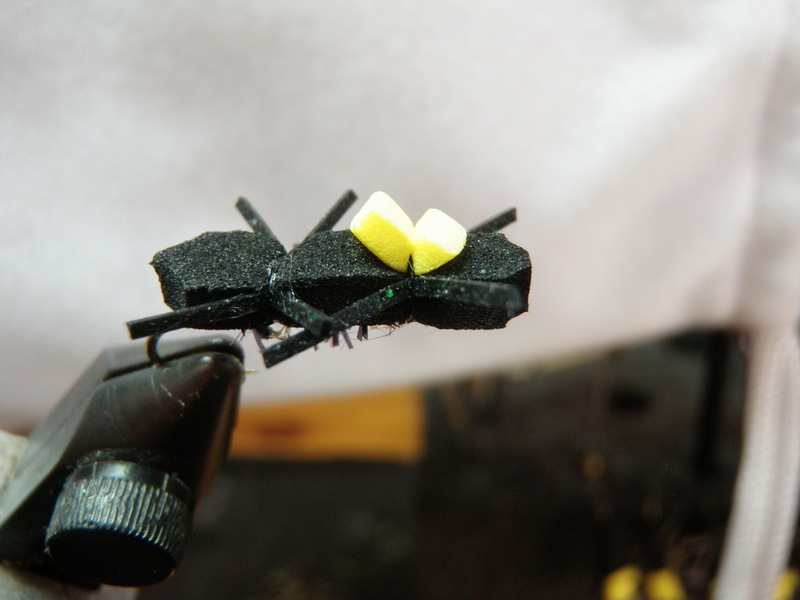 Given its status as my new number one, I decided to manufacture 15 new flies in preparation for 2014. As I began, I decided I wanted to improve the fly and eliminate the spinning problem that is endemic to my method of tying. Most Chernobyl patterns and tying instructions use two layers of foam with one on top of the hook shank and one below creating a hook sandwich. I like mine to have an iridescent body so I wind a pearl black chenille around the hook shank between the two tie down points and expose the underside of the top layer of foam. Unfortunately if the foam on top of the shank is too wide, I cannot obtain a solid tie down to the narrow hook shank. I improved the strength of the bond somewhat by wrapping dubbing over the thread at the tie down points to provide more bulk and friction for gripping. In addition I apply excess amounts of head cement to the tie downs and the head, but even with these improvements, a solid Chernobyl ant eventually spins after two or three catch and release cycles. It is very frustrating to hook an apparent decent fish only to lose it and discover that the hook twisted so that the hook point was pointing sideways instead of downward. 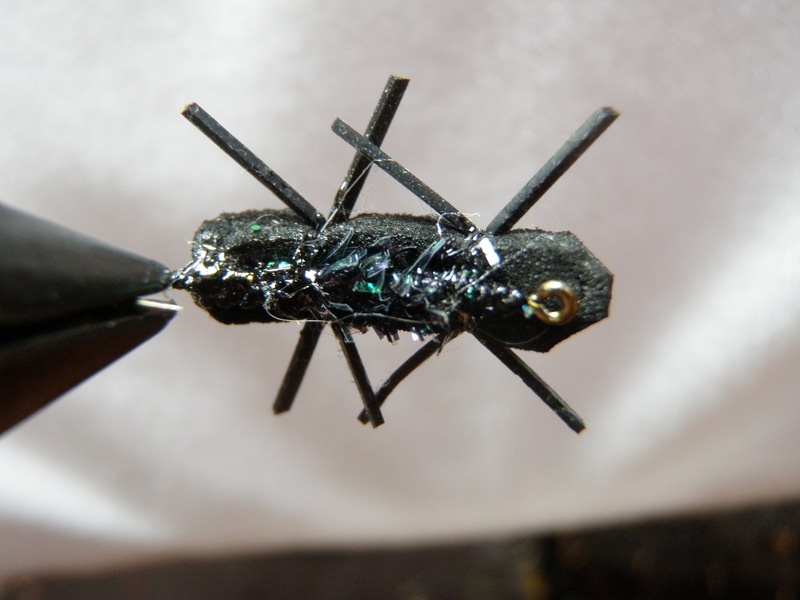 My friend Jeff visited last summer for some September fly fishing, and having read my rave reports about the Chernobyl ant, he decided to tie some in advance of his trip. I didn’t bias his tying with my methodology, and he invented his own unique method which included notching the foam at the tie down points. As I began to tie Chernobyl ants I planned to experiment with notching, but when I made my first prototype I discovered that the narrow V notch caused the rubber legs to flare out perpendicular to the foam as two tight parallel appendages. I didn’t like this look so I fired off a text message to my friend Jeff for advice on his methodology. In the process of exchanging text messages, Jeff mentioned that he tied the foam in at the bend and then bent it back over the top of the shank. This set off flashing lights in my brain as I guessed that a solid tie down of the foam at the hook bend would prevent the foam from spinning. I immediately began a new fly and cut the end of my black foam strip to an arrow point and then attached it to the bend of the hook with quite a few solid wraps. I moved forward and created the dubbed bases for tie down along with the iridescent underbody with the pearl black chenille and then returned my thread to the rear tie down point. I folded the foam forward and snugged two or three strong wraps around the body creating a slight indentation. At this point I attached the rubber legs to the side of the foam as I had done previously and then moved on to the forward tie down point and added an indicator and front legs. I feel that this method of tying solves the spinning problem while maintaining the key triggering points of the original fly that has produced well for me. A season of fishing will be the true test, and I can’t wait to get out on a stream to toss some new and improved Chernobyl ants. I can probably count on one hand the number of times I’ve skied fresh untracked powder since I began skiing forty years ago, and fresh untracked powder is defined as a minimum of four inches of fresh snow overnight. In order to be able to enjoy this experience roughly four main factors need to merge simultaneously. First, there needs to be heavy overnight snowfall, enough to add four inches to the packed snow already on the ground. Second it needs to be a day when I am not already committed to work or some other activity. Third, the driving conditions cannot be so severe as to preclude driving to the destination ski area, and lastly I need to be lodging close enough to the ski area so that I am able to reach the ski lift before it begins running. 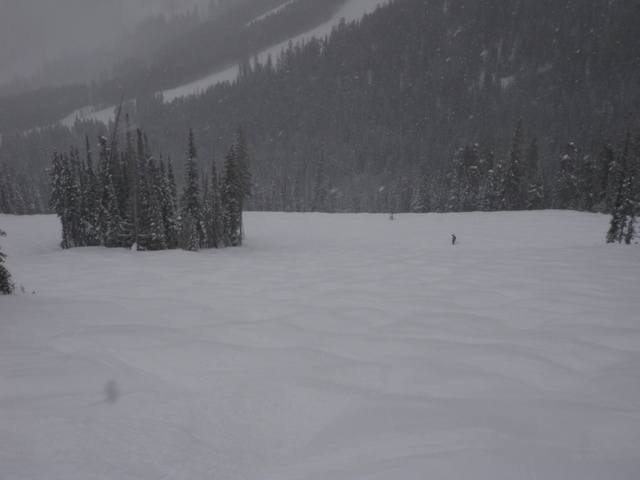 Skiing fresh untracked powder does not include finding out-of-the-way stashes several days after the event in glades or expert terrain or in places where strenuous hikes are required while carrying one’s skis on one’s back. Amazingly Monday February 10 was a day when the confluence of all of the above factors occurred, and I enjoyed skiing some fresh untracked powder at Beaver Creek in the morning. Five inches of fresh snow piled up Sunday night into Monday morning, and Jane and I were staying at the Timbers at Bachelor Gulch as guests of Jane’s sister Judy and husband Bill. We were in the enviable position of being located in a ski in, ski out condo, so we made plans to get up early enough to be in the lift line before 8;30. We ate a light breakfast and hustled to put on our boots and jumped in our skis and poled over to the Bachelor Gulch express lift and took our positions fourth in line. Sure enough when the lift opened at 8:30 we were on the fourth chair, and we were whisked to the top of the Bachelor Gulch area. 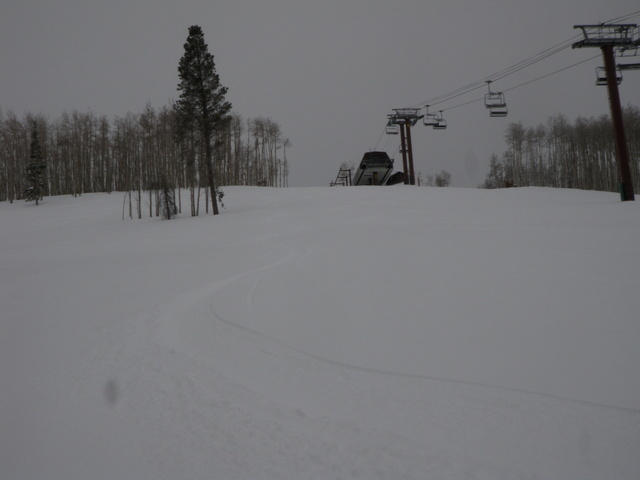 It was still snowing quite heavily when we skied off the chairlift, but the snow was easily five inches deep and my heart raced at the prospect of encountering fresh untracked powder. Grubstake was my trail of choice as it was probably the steepest intermediate trail that would get me to the Beaver Creek Express. Jane elected a different path that Y’d off to skier left, and I was on my way down Grubstake right below the chair. What fun! I floated on the puffy soft powder and hooted and hollered to my heart’s content as I was by myself with only an occasional occupied chair infringing on my solitary entertainment. This was really the only pure untracked run of the morning, but Jane and I continued across the ski area to the Rose Bowl and Ripsaw where we found more sparsely tracked powder that added to our euphoria. Once we skied Ripsaw we were at the extreme eastern end of Beaver Creek so we worked our way back across the mountain toward Bachelor Gulch, and by now most of the runs were tracked out as skiers appeared in increasing numbers. I analyzed the trail map and hypothesized that the last places to get tracked would be the black and double black runs on Grouse Mountain, so I asked Jane if I could make one run there before we returned to the condo. She approved of my plan, but decided that she would bypass the expert venture and remain on Larkspur while I searched for steep powder, and we would meet again at the Larkspur lift. Off I went up the Grouse Mountain lift and the slopes below did indeed appear to be largely untracked with copious amounts of snow converting the large moguls into small mounds commensurate in size with prairie dog hills. Once I disembarked on the summit of Grouse Mountain I chose Screech Owl as my trail for descent as it plunged immediately off to skier right, and it seemed most of the skiers were heading toward Raven’s Ridge below the chair. It turned out to be a great move as the steep upper portion of Screech Owl was largely unmolested, and I bounced over and through the large moguls topped with soft white stuff in a rare euphoric state that I will label “powderstruck”. 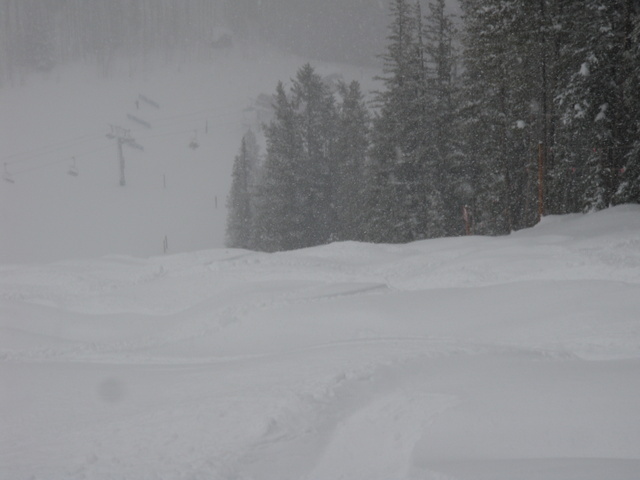 First tracks on fresh snow remains an experience to be cherished. Two of the buggiest natural materials used in tying flies are peacock herl and hare’s mask fur. The 20 incher combines both to create a fish catching machine. I’ve had a decent amount of success with the 20 incher pattern in the spring before snow melt and in the fall season. It may produce at other times, but I’ve only been using it for two years and haven’t experimented with it extensively in other portions of the fishing season. I weight my 20 inchers with lead wraps that span 2/3 of the hook shank beginning at the bead, and this yields a large weighted fly that sinks rapidly. In the spring season I like to use the 20 incher as my top fly with another hatch matching fly such as an RS2 or caddis pupa below it as the point. The weight of the 20 incher enables me to forego crimping a split shot to my line. I plan to tie eleven additional 20 inchers for 2014, and I made good progress last night with four remaining to be completed. I have been using copper wire to counter wrap the rib over the abdomen, but the standard pattern calls for a larger flat gold wire. I think I have some wire that fits that description, and if I can locate it in my fly tying desk, I will use it on my final four. Another deviation I make is to use Tyvek for the wing case. Tyvek is the material used in FedEx envelopes and is nearly indestructible. I color a section of Tyvek on both sides with a black magic marker and then cut a strip the width of the abdomen and tie it in where a turkey wing section is normally added. Hopefully I will use the 20 incher more in 2014 and enjoy great success. Do buggy materials equal a buggy fly? I thinks so, but the fish will be the true judge. How can a fisherman ignore the allure of an iron sally? In my opinion this fly is the most attractive nymph ever invented with its abdomen constructed with woven gold ultra wire and black crystal flash strands. Using the remnant crystal flash strands for legs and the associated movement and flash was another creative stroke of genius. I first became acquainted with iron sallies when my friend Dave Gaboury and I booked a day of guided fishing with Taylor Edrington of Royal Gorge Anglers on private water on the Arkansas River around the middle of September 2012. After experiencing some solid fishing with the iron sally during this fun day on the river, I resolved to tie some for the 2013 season. I watched an excellent YouTube video demonstrating how to manufacture these beauties, and then headed to my favorite local fly shop to purchase additional necessary materials – gold ultra wire and black crystal flash. Last winter I tied five prized iron sallies and upon completion decided to add them to my flybox rather than convert them into earrings for my wife. They are that pretty. 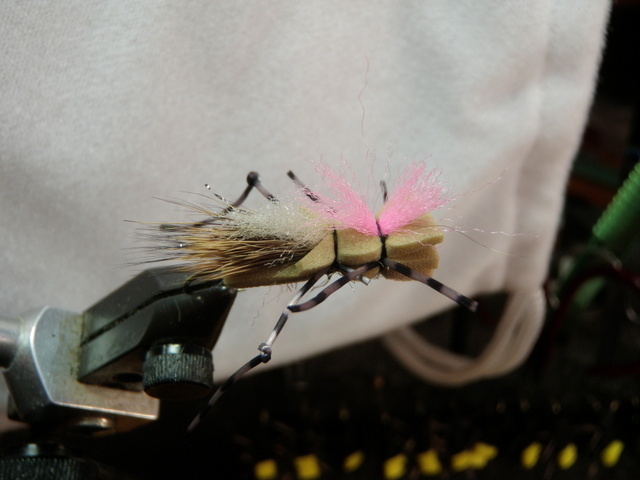 I fished the pre-snowmelt season without ever touching my new creations, but during a trip to the Arkansas River in early August when I was struggling to find a productive fly, I spotted the iron sally in my fleece pouch. It was a warm day with no cloud cover, and I was landing an occasional fish, but nothing seemed to produce any consistency. The iron sally is intended to imitate yellow sally stoneflies, and I spotted several fluttering above the river, so I decided to experiment with the glittering nymph. The decision proved to be a smart one as my catch rate improved, and I landed quite a few nice fish on the jewel on my line. Now it is the winter of 2014, and I decided to produce ten more shiny iron sallies. They are completed and hang from my foam tool organizer near the window and reflect light from all angles. I can’t bring myself to stash them in my flybox because they are so beautiful. Shortly after Jane and I moved to Colorado in 1990 we decided to purchase cross country ski equipment since we experienced more snowfall in Castle Rock than we were accustomed to in Allentown, Pa. More important than the amount of snow, however, was the quality of the snow due to the higher elevation. We quickly learned that when it precipitates in the winter; it snows, and we weren’t faced with rain, freezing rain, or sleet. We continued enjoying our equipment over the next twenty years, but Jane gradually realized that her boots did not fit properly thus leading to foot pain and blisters. Consequently for the last two or three years when we’ve skied together, we generally visit a nordic center where she can rent boots, skis and poles. True to my frugal nature, I persisted with my 20+ year old skis and boots, although I noticed my skis tended to ice up quickly on snow that was soft or warmed by the intense rays of the sun. As Christmas approached in 2013, I asked Jane if she had any gift wishes, and she mentioned cross country ski boots. Before departing for Argentina we made a visit to Wilderness Exchange and then REI to examine their ski packages, and Jane eventually settled on some new skis and fashionable black boots. I purchased these and hid them from her and then wrapped and placed them under the tree. While at REI I asked the salesman if there was a way to revive my ancient Fischer skis, and he suggested a can of SWIX wax. Jane purchased this item for me; I totally forgot about it, and it reappeared as a stocking stuffer on Christmas morning. On the Sunday after Christmas our entire family decided to go cross country skiing, and Jane welcomed the chance to test out her new skis and boots. We chose Eldora Nordic Center because Joe, Amy and Dan needed to rent skis, and we didn’t wish to battle interstate 70 traffic on a Sunday between Christmas and New Year’s. Jane had a great day on her new set up and did not experience any sort of pain or blisters. I meanwhile defaulted to my old skis and boots, and I was noticeably slower than the rest of the family. 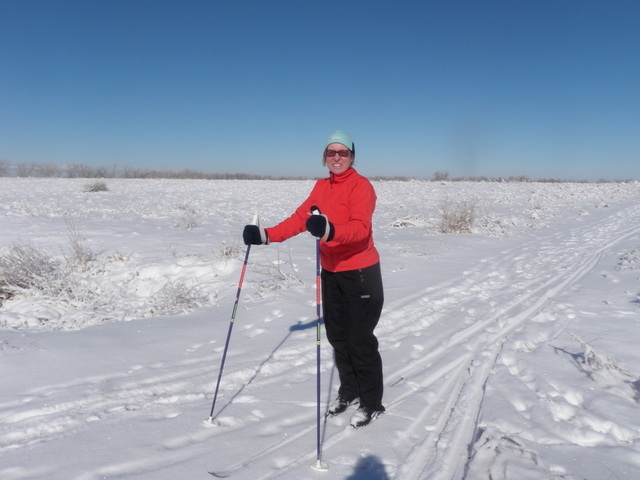 The air temperature was quite cold, probably around 20 degrees, so I did not have issues with ice forming on the bottoms, but clearly my skis did not glide smoothly like those of Jane, Amy, Dan or Joe. My new can of ski wax was still secure in its packaging as I forgot to break it out for the Eldora trip. When I returned from Eldora I remembered to carry my skis downstairs and then the next day after they had dried, I applied a coat of the new wax. Applying was a simple task using the sponge pad that came in the can, allowing the wax to dry for one minute and then wiping off with a rag. My newly waxed skis rested in the garage awaiting some significant snowfall in Denver to be tested. At the end of the last week of January Denver received approximately 4-5 inches of snow, so Jane and I decided to break out the cross country gear on Saturday morning. 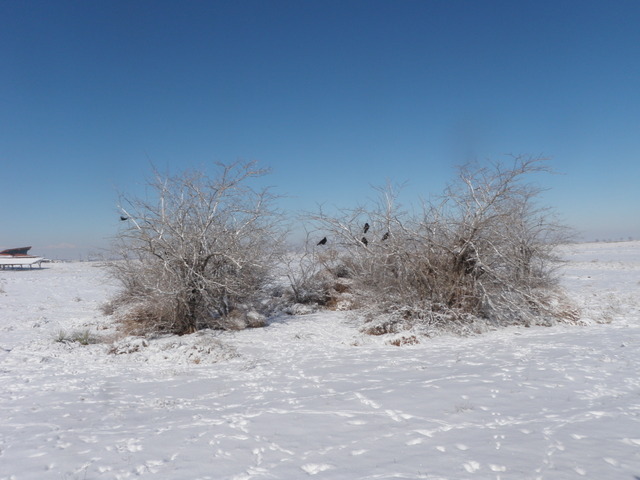 We did a loop along the Sand Creek Trail and then through Bluff Lake Wildlife Area and then returned to the house. I was ecstatic over the performance of my “new” old skis. In fact, I can’t believe I skied with slow sticky boards for as long as I did without applying wax. 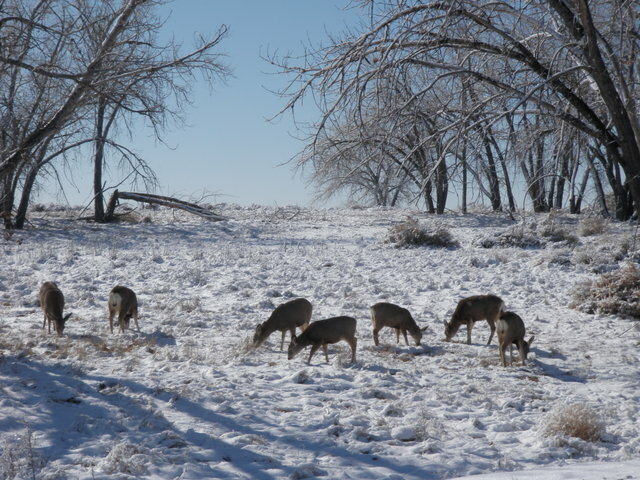 We had so much fun on our one hour and fifteen minute loop that we decided to venture north five miles to the Rocky Mountain Arsenal Wildlife Refuge on Sunday morning. 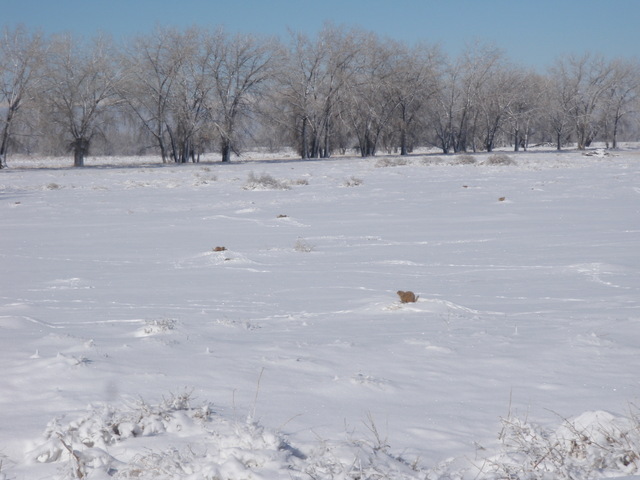 What a joy it was to smoothly glide over the crisp four inch layer of snow in the refuge with no one else around except for prairie dogs, deer, eagles and a coyote! I can’t wait for more snow to arrive so I can continue to cruise in my twenty year old skis. Caddis are very prevalent on all Colorado rivers and in fact in nearly every river and stream that I’ve fished. Caddis adults are easy to recognize due to their wing folded like a tent over the abdomen and their erratic style of flying above the water. I’ve experienced some great outings when caddis are the preferred surface food, and on many of these occasions an active drift is required to initiate a take by the fish. The fish recognize the fluttering caddis and selectively seek movement in their prey. Trout may devour even more subsurface caddis in the form of larva and pupa, but this activity is much more difficult to recognize as we fishermen cannot readily see the actions of fish beneath the surface. Through many years of experience and by reading reports and suggestions from the experts at fly shops, I have managed to achieve some level of success using caddis pupa. 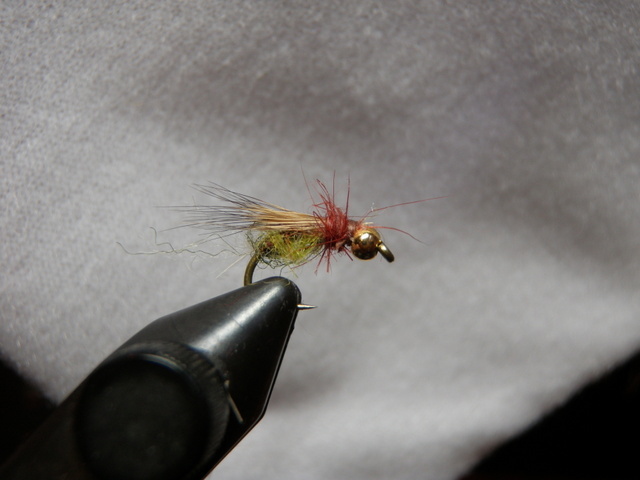 The period of time in April before the major caddis emergence on the Arkansas River is my main workshop, and the caddis pupa has proven to be a great fly to entice takes during this period. The bright green caddis pupa which imitates the grannom caddis typically represents my strongest producer, particularly in the weeks closest to the main emergence of the adults. I have discovered that the best time to fish the bright green caddis is from 11AM until around 3PM, and success depends to a large degree on imparting movement to the fly. I typically fish a two fly system with a strike indicator and split shot during this time period with the bright green caddis on the point and either a caddis larva, emerald caddis pupa, or prince nymph as the upper fly. In some instances I fish the bright green caddis in combination with a RS2 since BWO hatches may overlap with caddis activity. To provide movement to the pair of flies I use two techniques. If I cast directly upstream, I continually raise and lower my rod tip as the flies tumble back toward me. This creates the illusion of a rapidly emerging caddis pupa, and I’ve experienced quite a bit of success with trout grabbing the rising fly. The second technique contradicts one of the universal laws of fishing; mend the line to allow the fly to flow naturally with the current. 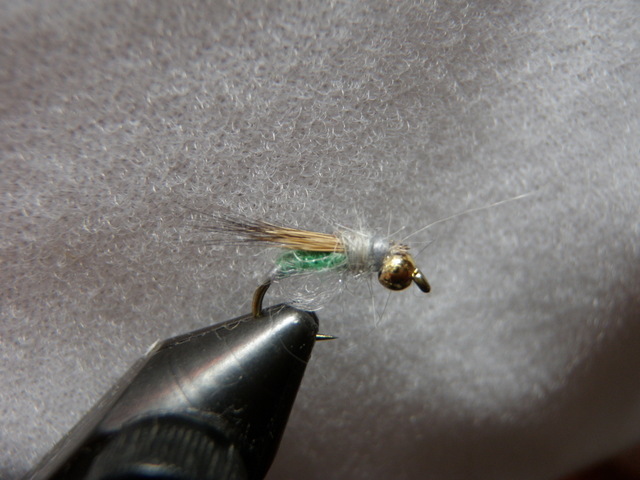 When fishing the bright green caddis pupa, I do the opposite and mend the line with the current. This generates a quick acceleration of the flies, and many times the fish slash at the pupa imitation thinking it is emerging and escaping their jaws. The emerald caddis is effective during spring, summer and fall but it doesn’t generate the frenzied feeding that corresponds to the bright green caddis and the April emergence. 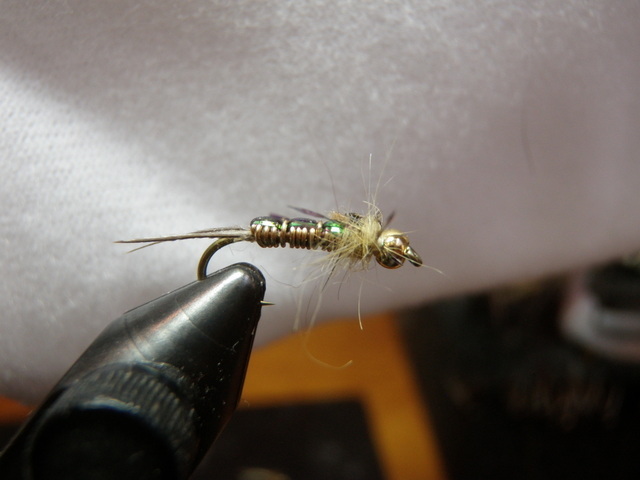 The emerald caddis is more of a distance runner compared to the sprint of the bright green caddis. I’ve caught several adult caddis that had a tinge of emerald color on their abdomen, so I believe that the emerald pupa offers a color that the fish have seen and recognize as a tasty meal. 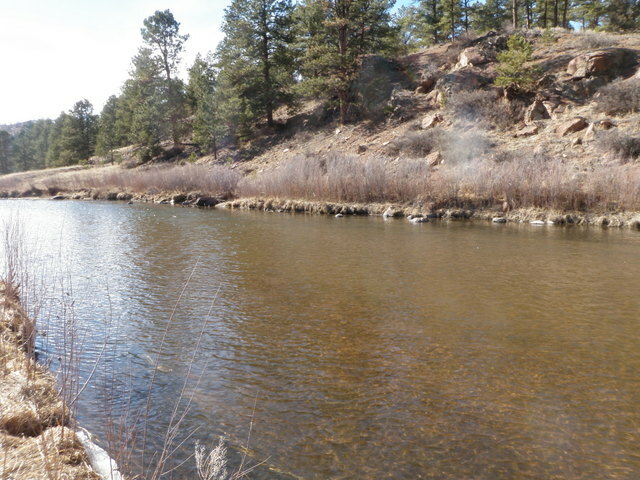 I can recall numerous instances when the water seemed dead in late afternoon, and I’ve tied on an emerald caddis and landed a few fish that snatched the pupa as it began to swing at the end of a drift. These two flies are definitely solid producers, and I always attempt to enter a new season with a generous supply from which to draw. For 2014 I tied twelve bright green caddis to bring my inventory to 50, and then I added six emerald versions to my carry overs to reach 30 as spring approaches.